Join the discussion on our forums! 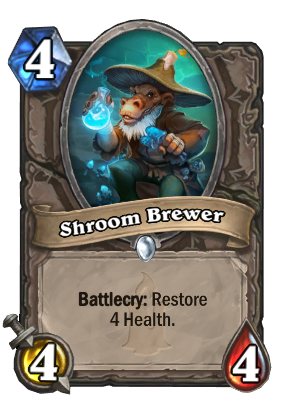 Come discuss Shroom Brewer over in our dedicated Shroom Brewer discussion topic. Why didn't they put the sounds for him? Refreshment Vendor saw play in every Reno Warlock, and with the new Demon cards there might be incentive to play a Krul the Unshackled and Kazakus Warlock list with this in it. This doesn't even give the 4 health symmetrically, is a 4/4 against Priest (albeit weaker statline vs. aggro) and also works on minions. Great card. I gotta get some Shrooma from this guy for my Khajiit friend. All targeted heals are good, this card might even see play in budget priest decks or control hunter/rogue because they have little or no healing options. 4/4, Heal for 4 for 4! heal is weak bad card. no, healing face is weak, healing minions is broken because it's another way to snowball a lead. Gadgetzan Socialite, Earthen Ring Farseer, Shroom Brewer. In this sequence, it seems like bigger is better. Yes, I have a good friend who loves Shrooms, lol so he will love this card. More heal for warlocks? Maybe? Nothing special, but a nice minion.